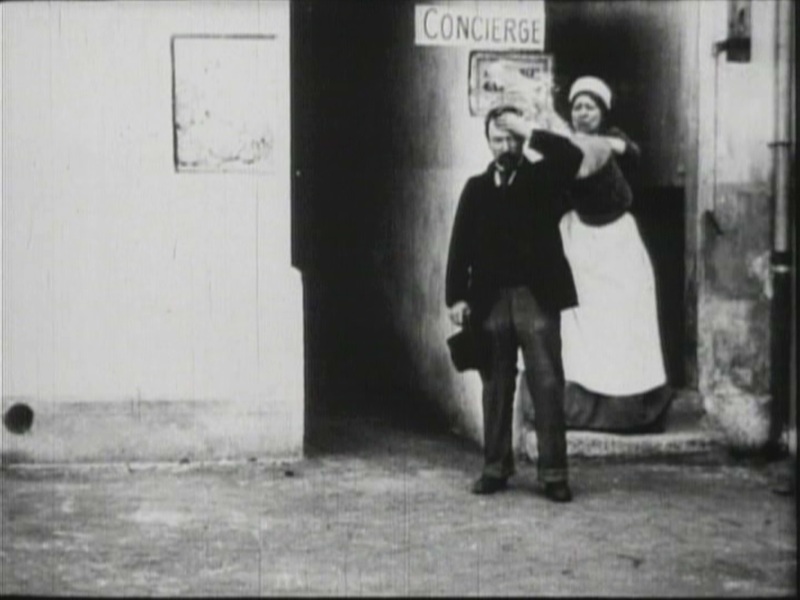 This is another simple comedy from Alice Guy’s period as a director for Gaumont Studios. It reminds me both of “The Sprinkler Sprinkled,” for being a typical joke about someone getting doused, but also “The Burglars,” because the setting is so obviously French, despite the lack of an elaborate set or location shoot. We see the front of a building and a middle-aged woman is sweeping the stoop. Behind her is a sign reading “Concierge” and a rope to ring the doorbell. A well-dressed man comes up to her and they haggle over money, he leaves and she takes a snort of snuff. Then she goes inside for a moment and some kids run up. They yank the doorbell and run away. The lady comes out to find no one, and shakes her fist. Then she goes back inside. The man returns and yanks the doorbell as well, and she throws a bucket of water over him, thinking he is the prankster. Then the kids rush onto the set and start laughing, and some adult extras also arrive and laugh, providing a kind of laugh-track to give the audience someone to laugh along with.